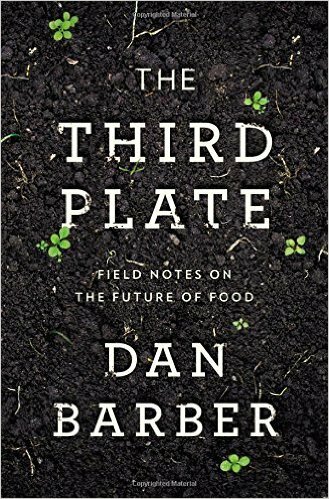 Barber's book tears apart aspects of the farm-to-fork movement, sustainability, and the way we look at farming. 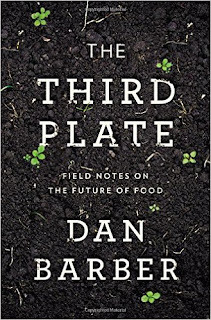 There are many topics and themes in his book, but the one that struck me as familiar during Pollan's talk was how, since World War II, agriculture started to piece apart elements of the soil in the same was as we pick apart the nutritional elements in food. Think of it this way. We started farming by adding nitrogen or calcium to the soil as individual components thinking nitrogen was the magic growth factor for increasing our yields. What happened to old fashion manure with all the bacteria, minerals, etc.? What we've been learning over the last 5-10 years is that piecemealing soil components is making our food worse. That what makes food good, tasty, and nutritious is all the enzymes, bacteria, vitamins, and minerals mixed up together in the soil. That we need to go back to the old ways of farming and nurturing soil in order to produce food. That healthy soil is what produces healthy food. At the same time, nutritionally we need to realize is that there is no magic, single item that will make us feel better and live healthier. What we now understand is that our body needs everything to feed our bodies and the bacteria in our guts that help us to digest. That by focusing too much on one or two nutritional components puts our gut bacteria and our bodies out of kilter. Vegans are healthy in some ways, but have have different health concerns. Same with those Atkins or meat lovers - healthy in some ways, unhealthy in others. Pollan on food, Barber on agriculture, both making the same point. Stop trying to take things apart and realize it's everything as a whole that keeps the soil or our bodies healthy. I'm really excited to hear Barber talk on Tuesday...perhaps enough to write something after. What matters is that I highly recommend his book, which I listened to him read in the audio version. And I must also recommend that after you read The Third Plate, watch the documentary The Symphony of the Soil, which we had at the 2nd Sacramento Food Film Festival. It was not only beautiful, but it covers that same discussion of restoring our soil to health by farming the old fashioned way.